Do I sow righteousness in peace? We zoomed in on the wisdom that is from God in verses 17-18. Let’s continue to see what God says about wisdom that is from Him. What are the characteristics of God’s wisdom? What are the results of God’s Wisdom? Let’s pick up where we left off yesterday in verses 17-18, and LOOK at the results of God’s Wisdom. Fruit that is harvested becomes a seed for the next planting. There are several here that I wanted to check out! Fruit, karpós; is produce. (II) Metaphorically, fruit, meaning: (A) Of deeds, works, conduct (Matt. 3:8; 7:16, 20; 21:43). (B) For effect, result (James 3:17). (C) By implication, for profit, advantage, good (James 3:18). Righteousness, dikaiosúnē; of character, conduct, etc. of doing what is right. Internal, where the heart is right with God, piety toward God, and hence righteousness, godliness (Mt 5:6,… Jas 3:18). Sown, speírō; is to scatter seed. Peace, eireânē; quietness, rest. (I) Peace, particularly in a civil sense, the opposite of war and dissension (Lk 14:32; Ac 12:20; Rev 6:4). Among individuals, peace, harmony (Mt 10:34; Lk 12:51; Ac 7:26; Ro 14:19; Heb 7:2). TIP: Let’s not forget to take the meanings back to the text. Understand: We reap what we sow. A farmer works hard to sow corn, reaping corn, not peas. How do those who make peace (peacemakers) make peace? What do those righteous acts reap? more fruit of righteousness and peace. 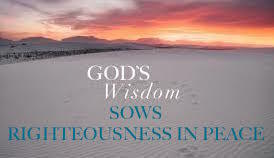 We see: we must work hard (think before we speak and act) to sow (scatter) seed of righteousness in peace, and that seed bears fruit of righteousness in peace, and the cycle continues. Isn’t this ever so cool? Let’s see what else God says about this fruit of righteousness in peace. We learned early on that we lay hold of Christ’s righteousness by faith, (Rom 3:22). 1. What are those of the faith filled with? 2. What else do we learn about righteousness? We see: we hunger and thirst for righteousness, and it is produced in us by the Spirit. 3. What do you learn about righteousness and peace being linked together? Understand: God’s wisdom has everything to do with righteousness and peace. Being right with God and right with man then there is peace. Is righteousness being produced in my life? Am I working hard to sow righteousness in peace? How so? What do I do when someone comes against me, persecutes me, speaks evil against me? we will earnestly work to be peacemakers. Be quick to hear. . .
God’s Word can change any anger issues we have. Let’s Sum Up James 3:17-18! Then, peaceable, gentle, reasonable, full of mercy and good fruits, unwavering, without hypocrisy. The Result: the fruit of righteousness is sown in peace. We are to sow righteousness in peace in the midst of our trials (circumstances and situations). 3. But we fulfill the Royal Law. Understand: Our behavior and our words prove if we have the wisdom of God. 1. Which of the characteristics that are ‘worldly wisdom‘ do I struggle with? How will I guard against them? 2. Which of the characteristics that are ‘Godly wisdom‘ do I need to work on? Talk to God, He loves you so much! He is right there to help you, and me too! OH FATHER GOD, we want to bless Your name forever and ever, as Daniel did. For wisdom and power belong to You. You change the times and the epochs; You removes kings and establishes kings; You give wisdom to wise men and knowledge to men of understanding. You reveal the profound and hidden things; And know what’s in the darkness, for light dwells with You, (Dan 2:20-22). Oh, reveal to us the condition of our hearts? Please forgive us when we have not been wise in our trials, failing to be peacemakers; failing to be gentle and reasonable; failing to show mercy toward others; guilty of being hypocritical and judging others. Oh Father, forgive us for the many times we have not sowed the fruit of righteousness. Father, help every single one of us. Oh, may all of us work hard to sow the fruit of righteousness. May we do what is right with You and others, pouring out that love and mercy to others that You have poured out on each one of us! May we be peacemakers, pleasing in Your sight! Oh Father, thank you for Your wisdom that has been given to us in Christ, in whose name we pray and ask these things. Amen! Don’t you love: your time with the Lord; learning to hear Him speak directly to you His Words of Wisdom? Next: We will wrap up these 2 kinds of wisdom, pulling everything that we have learned together so we can live our lives according to God’s wisdom, not man’s. James 3:17 God’s Wisdom: Is Unwavering, Without Hypocrisy – Part... James 3:13-18 IT’S A WRAP! How Do I Reflect the Wisdom of God?